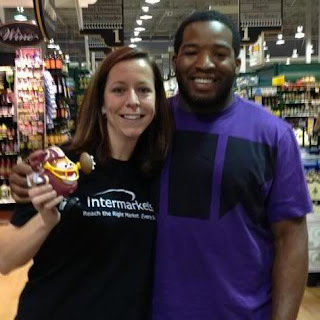 My coworker and I were just minding our business at work and we were informed that Alfred Morris was going to be at the Harris Teeter down the street. Fred, as close friends like myself call him, was there promoting his new "Chicken a la Mo" sandwich. Both my coworker and I were a bit tired after a long night of watching the Redskins whip up on the Giants, but the left over adrenalin from the win and the smell of deli meat lured us into the grocery store. To say I was nervous was an understatement. As I stood in the line to meet the rookie star, my palms dripping with sweat, I recited in my head what I would say to him. "You were great last night"
Now that is something I haven't said in a long long time...at least concerning Washington Redskins players...uh...wait...digging a hole here...let's forget about this whole paragraph. The guy a few people in front of me also must have been contemplating his own zing all day because he asked the running back, "So...did you drive your old '91 Mazda here?" as he took a horrible picture. Fred was not impressed as it was most likely the 30th time someone used that line on him that day. Did you really think that was creative bro? The next guy up, to the delight of the long line of people, brought his crying son to the event. As the screaming child approached the Washington Redskin, Fred said, "Uh Oh, Stranger Danger!" The father/son also took a horrible picture, and finally it was my turn. All of a sudden I was Ralphie from A Christmas Story, except I was an adult...and I was holding a Mr. Potato Head Doll...and Santa was more of a muscular and stocky football player...and yes, I said I was holding a Mr. Potato Head. "You were great last night!" Fred laughed at my Mr. Potato Head and asked where I got it. Uh oh Fred! That wasn't in the script!!!! I mumbled something that was so dumb that I can't even specifically remember what exactly it was. I immediately decided to get my money back from that improv class I took. Suddenly my hangover from the previous night’s celebration was gone. My feet floated off the ground while actually remaining on the ground. I dunno...it was weird. I've been a Redskins fan my whole life, but that was the first time I got to meet an actual player and get an autograph. And I couldn’t have gotten it from a better player and person. Thank you Fred!